This verse is omitted in some early manuscripts. The sun (unseen on the right) illuminates this scene, casting shadows to the left of objects and people. Jesus is wearing his usual blue outer robe and pale inner robe, and is pointing to himself, I the centre left of the scene. 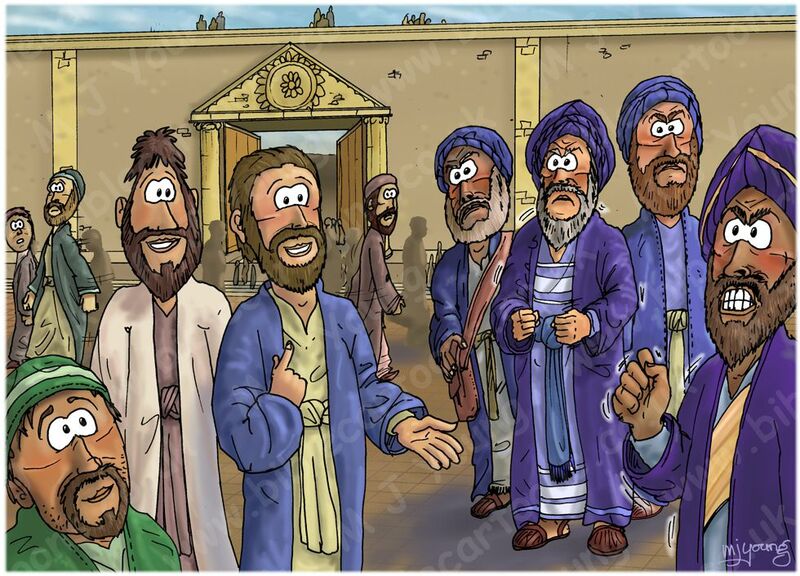 Simon-Peter stands behind Jesus, wearing his usual pale outer robe & red-brown inner robe. Some chief priests and Pharisees are standing on the right of the picture, looking cross and incensed at Jesus’s words. Various people in the background. In the background you can see one of the entrances to the inner courtyards of the Temple, with various people going in and out. There are even people on the flat rooftop, looking down. I have drawn small tiles as the flooring of the courtyard the action of this scene takes place in. This is the final scene in my “Wicked tenants” series. In it you can see Jesus talking about the cornerstone/capstone and pointing to himself, identifying himself with it. 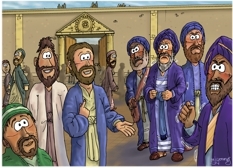 I enjoyed making the expressions of the chief priests and Pharisees look cross, annoyed, fuming, angry, etc. They were offended by Jesus’s claims about himself and who he was, and also because they realised he was identifying them as being the wicked tenant farmers in his parable. The chief priests and the Pharisees would have liked to have had Jesus arrested there and then, but they feared the crowds of people, who hung on Jesus’s every word.